The Treeing Walker Coonhound is a beloved dog – so beloved that she has been given the nickname “The People's Choice.” You may recognize her as the dog that looks like a larger version of a Beagle. The Treeing Walker Coonhound breed came to be as a result of the efforts of two breeders in Kentucky. 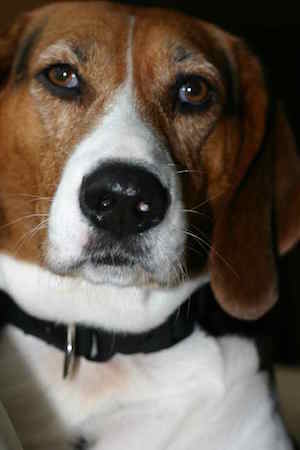 The dogs the breeders initially bred – Walker Hounds – were bred for the purpose of hunting raccoons. One day, a stolen dog of unknown origin was bred with a Walker Hound, and the stolen dog’s traits dominated the traits of the Walker Hound, leading to the Treeing Walker Coonhound that we know today. The breed was not recognized as its own breed, however, until 1945. Don't be fooled by the “walker” in her name. Because she has a higher energy level, the Treeing Walker loves to exercise. The hound in her means she also loves to hunt. So, if you are into hunting, then this is the ideal breed for you. Now the barking may become a problem, especially if she's barking at everything that moves. But because she's so smart, this is something she can easily be trained to control. The Treeing Walker is eager to please. However, she also has a stubborn streak that may impact your ability to train her. In order to keep her interest, you may want to vary up your training methods. Make a game out of it, and be sure to heap on the praise. You can use treats but use them sparingly. It's important to keep an eye on your Treeing Walker's weight, and treats, just like junk food, can pack on the pounds quickly. With the appropriate amounts and types of grooming, exercise, and food, you can keep your Walker Coonhound happy and healthy into his senior years. Grooming a Walker Coonhound is a dream. Because of her short coat, it's easy to brush off any dirt she may roll around in with just a damp towel. She doesn't require frequent baths – only occasionally. You'll notice her coat stays shiny with little maintenance. Trim her nails when you notice they're causing her discomfort. Clean her ears regularly to prevent infection. Your Walker Coonhound will love the attention and closeness with you that cleaning her provides. The Walker Coonhound is an active breed and, as such, she loves to run. However, this breed won't keep you on your toes all day like a Husky would. She is just as happy lounging around as she is chasing after a ball. But remember, because she's a hound you'll definitely want to leash her up for walks. Once she catches a good whiff of potential prey, she's more likely to be off and running. Bottom line is to make sure you and she both get a chance to exercise daily, the benefits are tremendous. As with any other breed, a high-quality dog food is ideal for the Treeing Walker. And, of course, the dog's diet should be appropriate to her age. Puppies get puppy food, while adults get adult food. For a slightly larger dog, the Treeing Walker has a remarkably long life expectancy of, on average, 12 to 13 years. On the whole, Treeing Walkers are generally healthy. You only really need to keep an eye out for hip dysplasia and ear infections. If you take your Treeing Walker hunting, you'll also want to keep her as safe as possible from injuries. Being the hunter that she is, she's not likely to back down from a fight. Whether you choose to adopt or shop, it's important to have some information in advance before you purchase a Treeing Walker Coonhound. Always do your research, especially before you spend your hard-earned cash. Make sure you are getting a healthy dog from a licensed breeder who has completed the necessary certifications before putting his or her puppies up for sale. It may surprise you that typically, Treeing Walker puppies cost between $400 and $600. Not a bad price. Interested in purchasing a Tree Walker Coonhound puppy of a higher pedigree? Then you should expect the puppies' price to be between $2,000 and $6,000. Big difference. Before adopting a Walker Coonhound, it is important to make sure that the puppy has received all of the necessary shots before you bring her home. Most adoption centers will also neuter the puppy before authorizing the puppy's release. Adoption fees, when compared to what you would pay at through a breeder, are significantly lower. Typically, for adoptions, you would pay about $150 to cover shots and neutering. Treeing Walker breeders, as with any other breeders, should be thoroughly vetted before you spend a dollar of your money with them. The breeder should be licensed and should have physical certifications proving the dog has been checked and cleared for the conditions that plague his breed. In this case, you would want to see a certification clearing the Treeing Walker of hip dysplasia, as well as any ear infections she may have at the point of purchase. Of course, with this breed ear infections can always pop up later on. But you don’t want to have to shell out extra money paying to fix something the breeder should have been on top of. The AKC has a Puppy Finder on its website that allows you to search for licensed, reputable breeders of a specific breed within your area. The Puppy Finder is also helpful for finding groomers, dog sitters, and dog walkers that come highly recommended. The Treeing Walker Coonhound is an active dog who lives to please. She's easy to groom and fairly easy to train, though she can lose sight of the target if she gets bored. Refrain from giving her an abundance of treats, but do heap on the praise when she does a good job. Whether you choose to adopt or shop, make sure you research the organization or breeder thoroughly before you take that puppy home. Make sure she has all of her shots and that she has been cleared for problems that typically plague the breed.